This is a recipe for the 5th, 6th or 9th of July, but not the 4th, when the grilling train pulls into town with its freight cars of steaks, lobsters, salmon filets, pork shoulders, eggplant, roasted peppers, whatever. Grilled Spring Onion and Strawberry Salad with Pistachio Pesto is easy–you could do it–but it will get lost amid the fanfare over Aunt Sophie’s famous deviled eggs, and the potato salad made with diced fermented sour pickles from Brooklyn, and the story about your brother Bob who almost blew his thumb off with an m-80 when he was a kid. Save it for a quiet day this weekend, when a meal with just one main course and only one or two sides or a salad sounds great, when there’s a bit of culinary light left to shine on a rare seasonal treat. 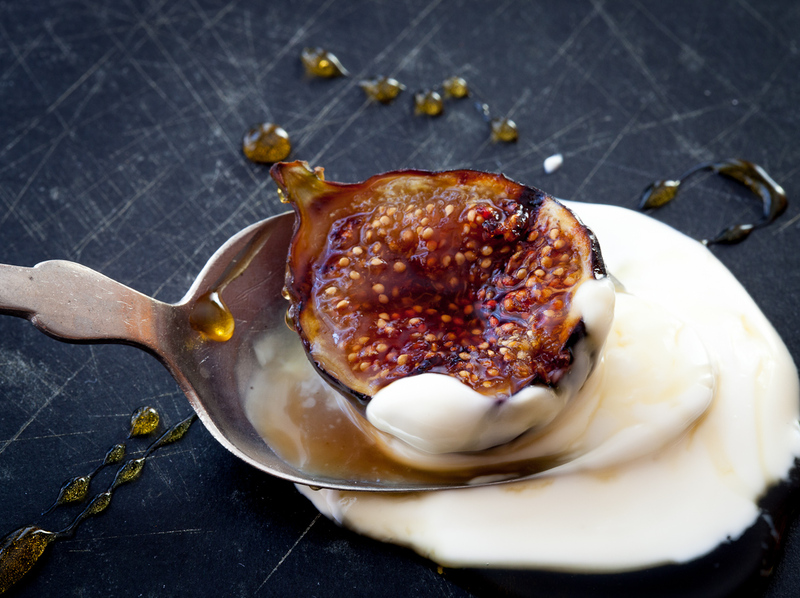 Grilled Figs with Creme Fraiche and Chestnut Honey. What??!! Two desserts in a row, what are Ken and Jody coming to? Nothing spectacular–the blog reflects what we eat, and during August we eat a lot from the grill, including dessert. I tumbled on to grilling figs one hot summer night when we were already planning on cheese and fruit for dessert and I had both figs and grill at the ready. Hmm, I wonder what these would taste like? Depends on how you feel about intense little packets of sweetness crusted with bits of caramelized fig sugar. You will find no dessert with as high a ratio of taste to ease as this week’s recipe. Jody and I both like simple, unfussy desserts with a couple of dominant flavors that compliment each other. A couple of weeks ago I laid my hands on a quart of wild blueberries, so my original vision for this included a wild blueberry compote. Jody, however, wanted to go with peaches. Since I couldn’t get my hands on any wild blueberries for the day we were scheduled to blog, she won. 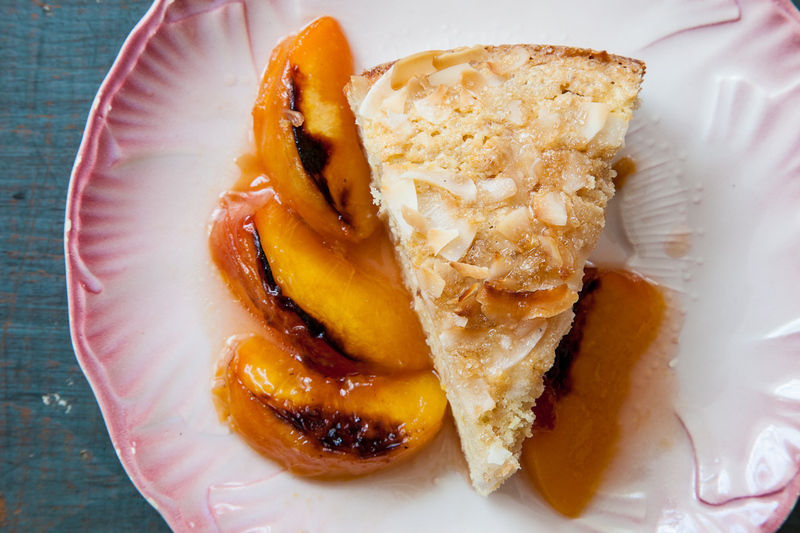 This is a simple Coconut Yogurt Cake with Roasted Peaches. The crumb is moist, with a rich with coconut flavor. And the peach accompaniment, oh man. If you give a mouse an ear of grilled corn, he’s going to want some grilled peppers to go with it. Or vice versa. The peppers have been so beautiful of late that we can’t stop eating them, or trying to figure out what else to eat with them. 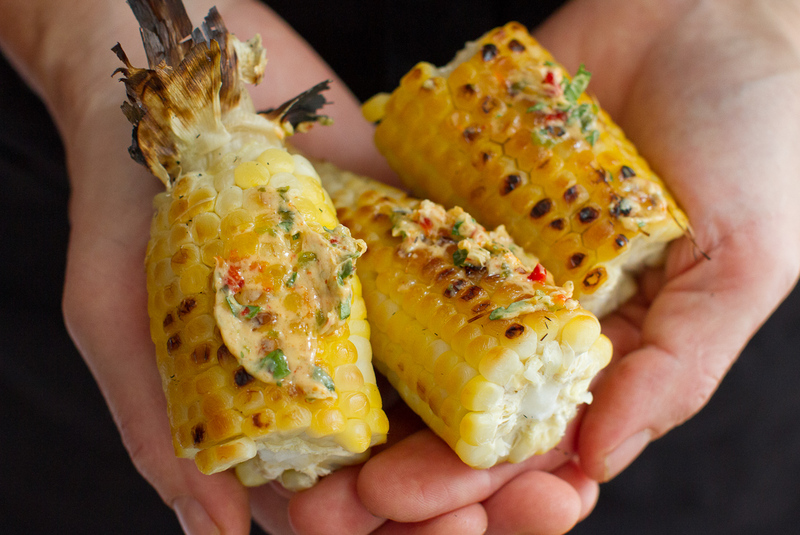 Now that corn is coming into view one of the treats of the season is Grilled Corn with Pepper Pecorino Butter. 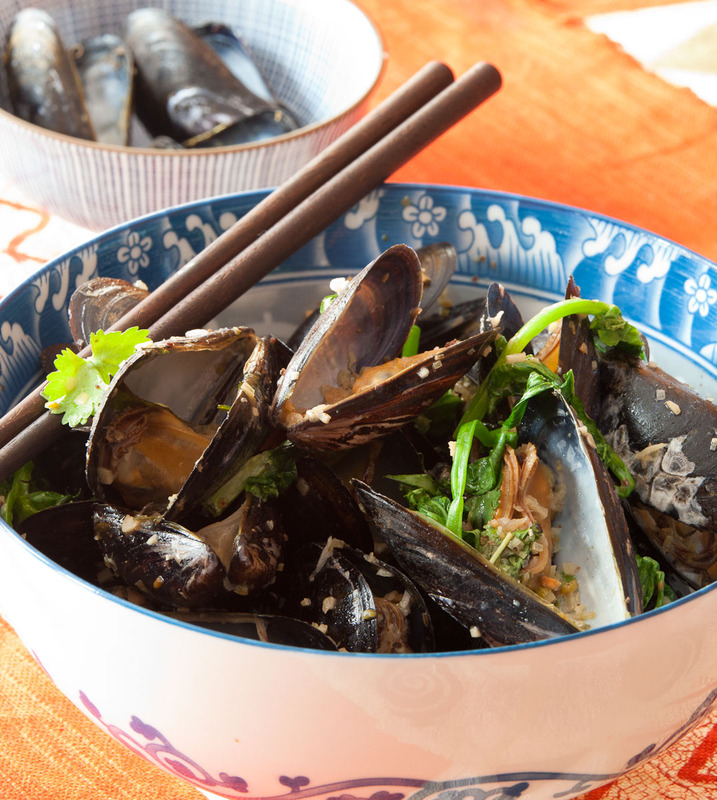 Grilled Mussels with Coconut Curry Broth–what more is there to say? Last summer we did a piece about grilling clams. Mussels–and oysters–work the same way. You pop them on a hot grill and wait. When they open, they’re done. We’re talking about very lightly grilled seafood here. As you can see from the pictures, Jody first made the coconut curry broth. Then we grilled the mussels (no, really, we grilled the mussels). If you’re deft with a pair of tongs you can get the mussels off the grill and into the coconut broth with minimal loss of mussel juice. Toss the mussels with the herbs and the coconut broth and Bob’s your uncle. 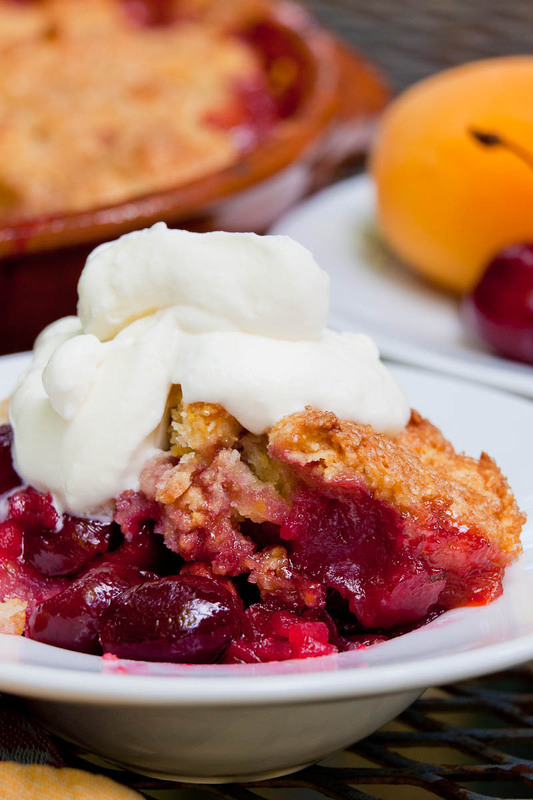 Today I had Apricot-Cherry Cobbler for lunch. Twice. A rare indulgence. I was outside taking pictures, the whipped cream was starting to fade–the rest of my family was headed for Cape Cod. What was I supposed to do, let it go to waste? It was a very satisfying lunch. This week’s subject requires no special expertise. Make the fruit filling, dollop it with the biscuity topping. Bake. It may be simple, but it’s as primally satisfying as a rope swing beneath a shaded tree on a summer afternoon. 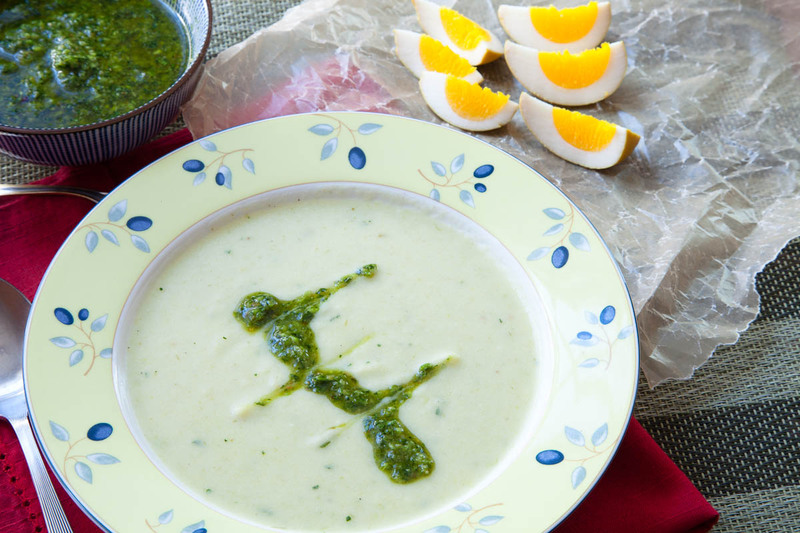 There’s nothing like a bowl of cold savory soup in hot weather, and until the day we do a post on jellied madrilene, this Chilled Garlic Scape and Buttermilk Soup will have to stand in. It’s a wrinkle on vichyssoise, close enough to feel familiar, but with a few turns you might not have expected, like scapes and buttermilk. Tart, garlicky, cool–you’re going to love it on a sweltering night.